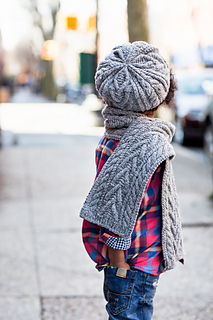 A plush cabled hat and scarf set provides jaunty warmth for sledding, cross-country skiing, or simply tramping out to the schoolbus. 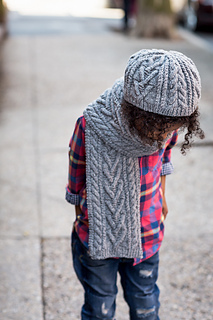 The pert, mushroom-shaped cap is worked up from a tubular cast-on hem in two skeins of Shelter and is sized all the way to adult dimensions; the matching scarf is a simple end-to-end knit that can be worked to any length. 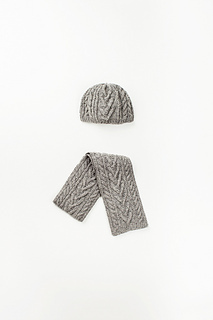 Both accessories feature a flight of chevrons filled with garter stitch and flanked by large and small simple cables to timeless and ageless effect. 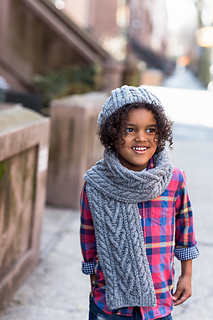 Please note: the stitch patterns in this set are charted only.